Fire group ticket sales senior account executive David Quinn gets ready to start the draw for the Windy City Ram Classic on Thursday night at Toyota Park. BRIDGEVIEW -- There was double the fun at the draw for the Windy City Ram Classic on Thursday night at Toyota Park. For the first time, the brackets for both the girls and boys tournaments, sponsored by Reavis High School, were drawn on the same night. Approximately 50 coaches came to the event, which featured food and beverages in the Second Star Club at Toyota Park, the home of the Chicago Fire. "It's always nice to see the coaches coming out and having a vested interest in our tournament," said Reavis girls varsity coach Phil Basile, who along with Rams boys coach Bob Morack served as the masters of ceremony. "⁮It's a nice way to kick off the season and get us prepared for the next few months. Really it's nice to see, especially on the girls' side, that the awareness and the emphasis is increasing ... from when I started eight years ago to where it is now. It's amazing to see how the sport has grown especially with female athletes." 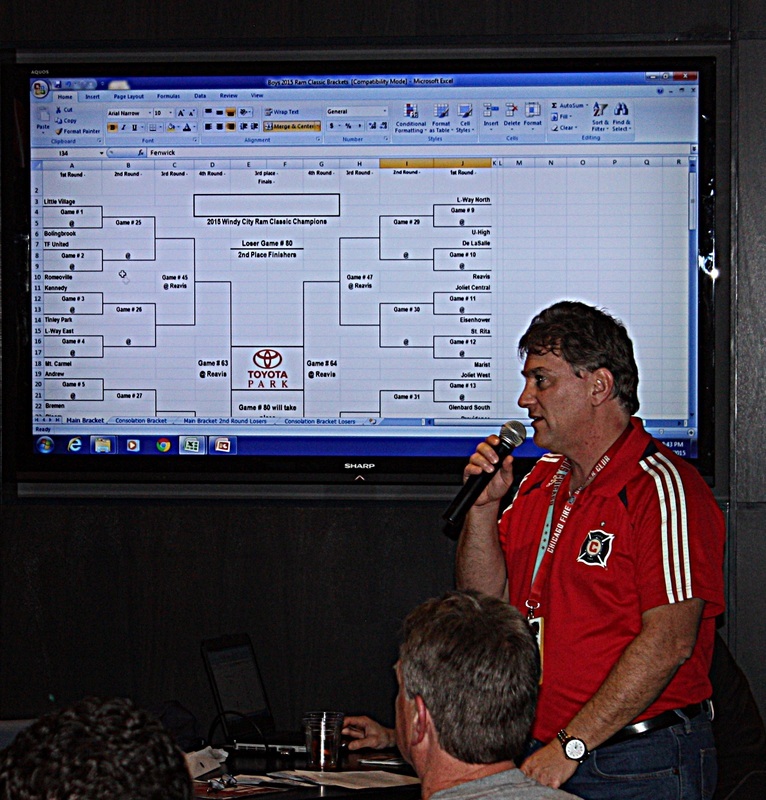 Fire group ticket sales senior account executive and event host David Quinn ran the draw for each tournament. They were organized to minimize early round match-ups with in-conference foes. For the girls tournament Romeoville, Homewood-Flossmoor, Lincoln-Way West, Glenbard East, defending champion Lincoln-Way North, Bolingbrook, Argo and Lincoln-Way East will host first and second round games. The first round matchups on the left side of the bracket are: Thornwood vs. Eisenhower and Beecher vs. host Romeoville; Shepard vs. host Homewood-Flossmoor and Joliet West vs. Queen of Peace; Morton vs. host Lincoln-Way West and Bremen vs. Bloom; and host Glenbard East vs. Joliet Central and Oak Lawn vs. Immaculate Conception. The opening games on the right side of the bracket are: Willowbrook at host and defending champion Lincoln-Way North, and Reavis vs. Fenwick; Tinley Park vs. Addison Trail and Providence at host Bolingbrook; T.F. United vs. Stagg and De La Salle vs. host Argo; and host Lincoln-Way East vs. Leyden and Oak Forest vs. Marian Catholic. The championship will be played at 4:45 p.m. April 4 at Toyota Park. For the boys tournament in late summer and early fall, defending champion Bolingbrook, Lincoln-Way East, Marian Catholic, Stagg, Reavis, St. Rita, Argo and Homewood-Flossmoor will serve as host sites. Little Village meets host Bolingbrook, and T.F. United faces Romeoville; Kennedy faces Tinley Park and host Lincoln-Way East meets Mt. Carmel; Andrew takes on Bremen and Bloom travels to host Marian Catholic; and Stagg hosts Oak Lawn and Thornton meets St. Laurence on the left side of the bracket. The right side of the bracket features: Lincoln-Way North vs. University (Chicago), and De La Salle vs. host Reavis; Joliet Central vs. Eisenhower and host St. Rita vs. Marist; Joliet West vs. Glenbard South and Providence against host Argo; and host Homewood-Flossmoor vs. Cristo Rey and Shepard vs. Fenwick. The date of the boys ' championship match at Toyota Park has not been set. It was a great evening for all in attendance. "It's an opportunity for the high school coaches to come out and have the fun of a draw," said Quinn. "They get to socialize a bit and maybe try and butter each other up once they know they've got to play each other. You see the smiles on the coaches' faces and you hear what they have to say. I think this is really cool. "Now they're trying to figure out: 'Is this the year I'm going to play at Toyota Park?'"